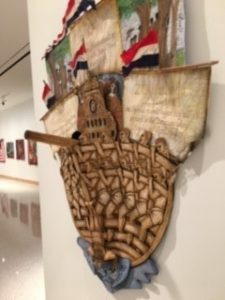 Honoree Dr. Carolyn Mazloomi’s exhibit, “And Still We Rise,” opened this week at the Spencer Museum of Art on the University of Kansas campus in Lawrence, KS. 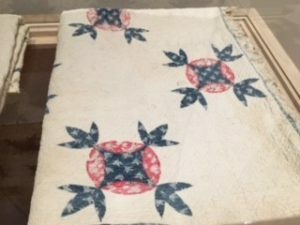 The opening coincided with the first ever National African-American Quilt Convention hosted by the African-American Quilt Museum and Textile Academy. While my schedule prevented me from attending the Convention, John and I were fortunate to be able to attend the exhibition opening last night. The exhibit is outstanding! It will be on display through September 17, 2017. 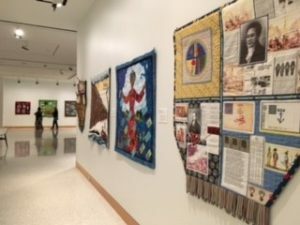 The quilt exhibit celebrates the history and experiences of the African-American community in North America. 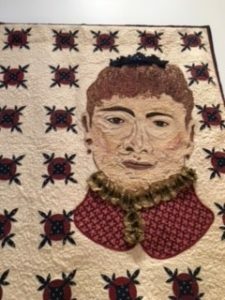 It is a “must see.” Thank you, Dr. Mazloomi and all of the quilters whose works are in the exhibit.